You want marketing that drives conversions. and customers into brand ambassadors. communicate the right message in the right way. creating a seamless buyer’s experience that turns leads into loyal customers. More than 5000 marketers ranked their top marketing struggles. Predictably, many are linked to lead generation and the buyer’s journey. other divisions work independently of each other. To get the results you want, you need marketing integration. to nurturing, to customer engagement to be in sync. Jones can get you there. Our process starts with strategic planning. Getting where you want to go requires having an end result in mind and a plan to get there. Jones gives you both. We identify your goals and design a complete integrated marketing plan to help you meet them. We start with the destination in mind and calculate the amount of revenue, new customers and website traffic marketing needs to generate. Jones brands to inspire and connect with your audience. We give you messaging that transforms the conversation, articulates a vision and links to a larger purpose. We develop a complex plan for delivering different types of content to audiences with varying needs and interests. Next we connect you with customers. Jones develops content and uses it to attract and engage leads. And, we equip sales to convert leads into customers. All content is not equal. 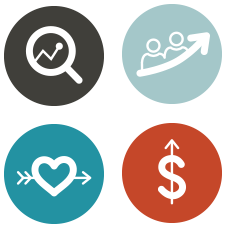 We give you engaging, search optimized, usable and shareable content that is tailored to your buyer personas. We use a mix of owned content, earned media, paid media and social media promotion to reach your audiences and attract them to your brand. Through segmented calls to action and dynamic landing pages we convert website visitors into leads. 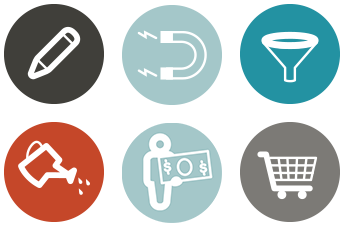 We nurture leads and guide them through the buying cycle with content matched to their interests and lifecycle stage. Before sending a lead to sales we verify budget, needs, influence level and timeline to ensure sales messaging matches the buyer’s needs. We provide sales with tools for success including lead intelligence, messaging, product materials, pricing guides, competitive comparisons and more. And we find ways to keep growing your success. We constantly analyze your program and look for ways to improve. We create programs that grow customer relationships, deliver further value and increase your success. As a HubSpot partner Jones uses technology and know-how to effectively evaluate your marketing metrics. We also harness the power of Wallop! to monitor and measure earned media results. We get more out of your existing relationships by offering reward incentives to brand ambassadors, developing beta customer programs and strategically asking for referrals. We design processes and materials that make your products and services easy to find, purchase and use. Then we work to keep customers engaged and happy. Finally, Jones provides messaging and training on how to upsell and cross-sell customers.